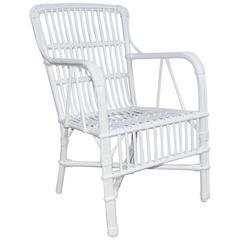 Three Classic American 1930s stick wicker armchairs in old worn white painted surface. Look at all pictures and read condition report in comment section. old worn white painted surface - areas loss chipping flaking to paint - chairs slightly different size - #1 w 30.5&quot; x h 35&quot; x d 24&quot; x s 14.5&quot; #2- w 29.5&quot; x h 35&quot; x d 24&quot; x s 14.5&quot; #3 w 33&quot; x h 34&quot; x d 26&quot; x s 15&quot; - all structurally solid / no breaks. 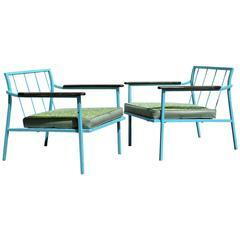 Heywood Brothers &amp; Wakefield Company Victorian armchair. Antique stick wicker chaise lounge woven of willow newly painted in black paint. Rounded back design with flat armrest. Measures: Arm height - 21.25" Seat height - 11.25". 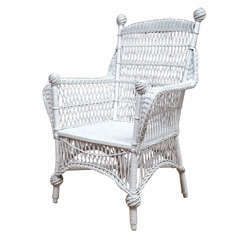 One garden rattan side chair Measures: Width 76cm deep ca.70cm Seat height 45cm Lean height 76cm Sitting area 55 x 45cm.